I love stir and bake cake, simply because of the fast preparation time and minimum washing is required. I was inspired by Ellena when she first shared her pineapple upside down cake baked in Happycall pan. The recipe she used was a simple stir and bake recipe yet the result as claimed by Ellena and as seen from the picture was fabulous. I have some green apples sitting in my fridge for the longest time, so I decided to bake an apple cake using Ellena’s recipe with some modifications. I also added blueberries since I had some in my freezer. In fact, this is not my first Happycall pan (HCP) cake. Prior to this, I had baked 3 cakes in HCP, including my favourite ultra soft & easy banana rum cake. Just to share, if you want to bake this banana cake in HCP, you need to double the recipe amount. From my few attempts I find that cake baked in HCP is generally moister, the texture is close to steam-baked cake. HCP-baked cake will have thinner and softer crust as compared to oven-baked one. This makes me feel that cake baked in HCP is less “heaty”. The trick to bake in HCP is to use very low heat. I normally use slightly higher heat at the beginning (say for the first 1 –2 mins) then switch to very low heat after that. 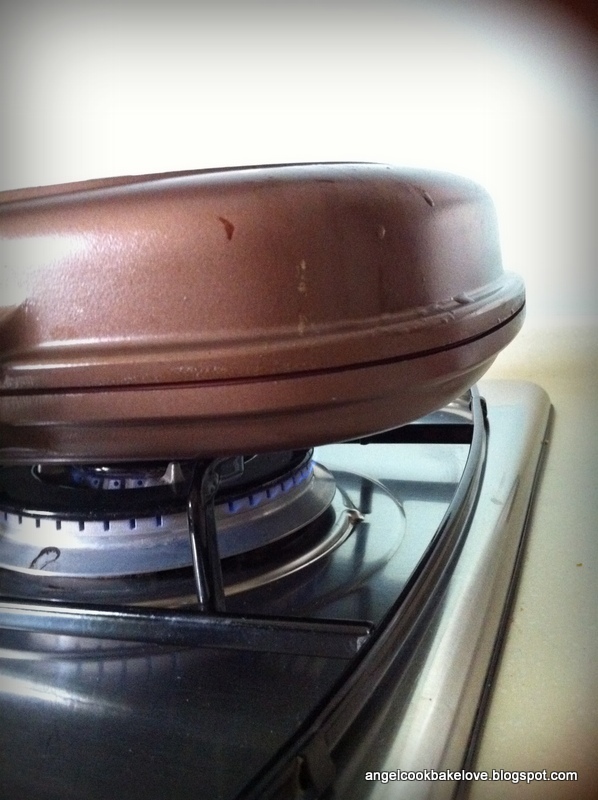 Do not be tempted to open the cover or flip the pan too early. This is what I mean by “very low heat”, you should only see blue flame. 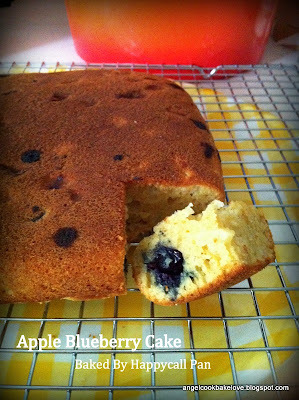 This apple blueberry cake is very soft and moist. The texture remains the same on the next day with more intense flavour. I like it light yet flavourful with the fragrance from butter and all the natural ingredients used. I consider this as a healthy cake that I will bake for my son. To make it healthier, partial wholemeal flour can be used to replace normal flour. *Both can be used interchangeable, i,e you can also use 120g of butter or 120g of vegetable oil or any combination added up to be 120g. **With this amount you can only taste hint of cinnamon in the cake, if you prefer more prominent cinnamon taste, use at least ½ tsp or more. ***I cut the apples into small cubes for easy cutting purpose, so that the apple cubes won’t drop out easily when serving. Cut into bigger chunks if you prefer to have some crunchy bites. **** If using frozen blueberries, do not thaw. Take out the frozen blueberries just before using, wash under running water and pat dry. 1) In a large bowl, beat (A) with a hand whisk till mixture turns slightly pale in colour (about 1 min). 3) Sift in (C) in 2 sessions, mix till just combined. Do not over mix; stop once you see no trace of flour. 5) Pour batter in Happycall pan, smooth the top. Cover and lock with magnet. Cook over very low heat for about 23-25 mins in total. Shift the pan left and right as and when in order to have even colour crust (though this is not necessary). I flipped the pan after baking for 20 mins and continue to cook for another 5 mins. 1) You may also bake this cake in the oven at 180C for about 40-45 mins using an 8” round tin or 20-25mins using muffin cups. 2) I didn't preheat or grease the pan. Love apple cake? Here is another recipe that you may want to check it up. At first I also have the same thinking as you. 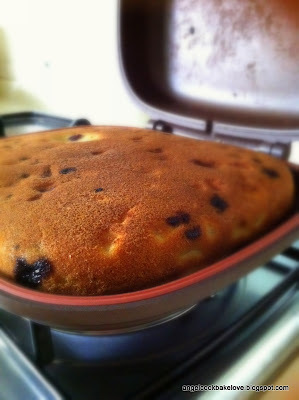 I still think that cake is best baked in oven which we can have more precise temp setting. The reason I based in HCP as it can reduce the baking time if I am baking a whole cake and I suppose not all cakes recipe is suitable to bake in HCP. Regarding the question about muah chee, yes, you can do that. I can also brush little oil on the surface of muah chee to prevent surface from turning dry. I think it's best be consumed within a few hours. I own a jumbo pan as well, to be frank the size is only slight bigger then the ocher deeper, and it suppose to be deeper than Ocher but I realize that the depht of jumbo at the bottom pan is actually more shallow than ocher, it's only the top pan is deeper. This doesn't make sense if you are using it to cook stir-fry dish. thks for the tip on muah chee, will do that next time! hmm..in that case, i think it is not that necessary to have the jumbo pan. Thanks for the mentioned Angel :) Your apple blueberry cake look awesome!!! Guess now we have all find a great tool to bake quick and yummy cake in no time. I have a good news to share with u. I tried to keep the muah chee uncoated overnight and it remained soft in the next day morning. Thanks for your great recipe. The credit is urs. I tried this recipe today.. Taste good. But mine just didnt raise as much like Urs ... Wonder why? Over mixed? Or the flame too low/small??? If your cake is cooked and crust is browning then I don't think the flame is too small. Mine also didn't raise up to the top of the pan. Regarding the height of the cake sometimes it can be due to the folding technique. So long as ur cake raise and not dense I think you have done a good job. Hi, came across your blog, if i am using jumbo grill, do i need to x 2 for the Ingredients or can i still use the same measurement as u stated above? Though I own a jumbo I have never used it to bake cake before. For this cake I would think that x1.5 times should be ok, x2 times may be overflow. If you use the original recipe your cake will be very thin.